Finding the best whole house water filter can be pretty challenging. The market is saturated with the numerous whole house water filters making it difficult to chose the one right for your home. We hope our in-depth review guide below will make your decision a little bit easier. Whole house water filtration systems reduce chemicals and contaminants in your water throughout your house. It connects to your main water supply line that supplies your house with water and dispenses clean, uncontaminated water out of your sink faucets, shower faucets, and even your laundry faucets–pretty much every place that you get water from in your home. It washes your dishes, your skin, and you even drink it, so why not make sure that it’s the best quality water possible? Having one of these systems is extremely beneficial because they purify your drinking water, reduce hard water spots on dishes and clothes, and can remove harsh chemicals like chlorine. It also decontaminates your water of other toxic substances like iron, fluoride, rust, arsenic, and sediment. 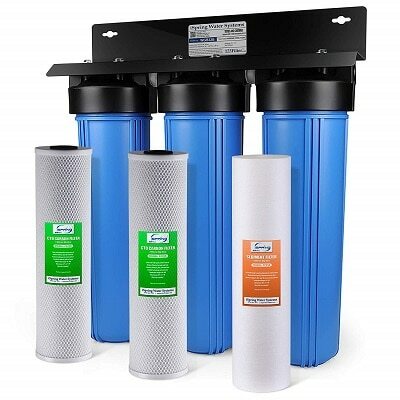 When choosing a filtration system, it is important to consider flow rate, filter size, filter life, and port size. These determine the water pressure in your home, the extent of filtration of chemicals, and how difficult or easy maintenance of your filter will be. 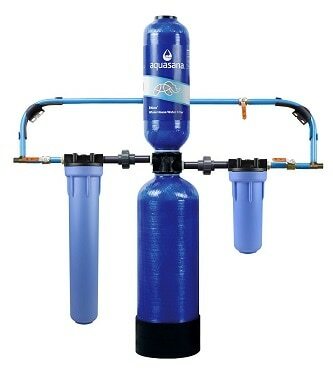 This Aquasana filtration system comes with an activated carbon filter that reduces levels of pesticides, herbicides, and other hazardous chemicals in your water. It also removes up to 97% of chlorine in the water–during showers, chlorine can escape and evaporate into the air. Aquasana’s filtration system removes this chemical, improving the overall quality of air in your home and making showers and baths easier on your hair and skin. It comes with an easy professional installation kit. This filter is great for your home if any members of your family have asthma and other breathing problems, or dry skin and brittle hair. Activated Carbon Filter: reduces herbicides, pesticides and other chemical compounds that may be present. This jumbo filtration system improves the flow rate of water in your home, as well as reducing the need for frequent maintenance. It filters out up to 95% of sediments, rust, chlorine, and heavy metals. It has a 100,000-gallon capacity and a one-inch port that improves water pressure up to fifteen gallons-per-minute. The iSpring Whole House Filtration System is the best water filter for your home if you are tired of constantly maintaining your current filter. The first stage high capacity polypropylene sediment filter achieves filtration down to 5 microns while the second stage CTO Carbon Block filter uses high quality coconut shell carbon for maximum filtration efficiency and filter life. Both are tested by independent third-party to meet NSF/ANSI Standards. With a built-in bypass valve system, the Watts WH-LD Premier filtration system is extremely easy to maintain and does not require you to shut off the water in your house before, during, or after maintenance. This package comes with three replacement filters and a wrench. It’s also one of the cheaper options so that’s something to consider. If you are on a budget, but still want to purify the water in your home, this Watts filtration system is perfect for you! It’s also extremely easy to install. The 3M Aqua-Pure filtration system comes with a non-corrosive stainless-steel head. Its flow rate is 20 gallons per minute, an extremely high level of pressure. The cartridges easily twist on and off, so the filter doesn’t require tools to install or uninstall it, and you don’t have to make contact with the filter when replacing it. This keeps you away from the filtered contents that may be hazardous. It has a carbon filter that gets rid of that harsh chlorine smell and color. If you want an easy, hassle-free installation process, this filter may be the best one for you. This APEX filtration system comes with a three-part filter. The polypropylene sediment pre-filter helps to get rid of larger pieces of sediment, heavy metals, and insects. The second and third filters are made of activated alumina and a granular activated carbon pad that get rid of the smaller particles, such as chemicals like chlorine, fluoride, and arsenic. It has a wide cartridge design that is perfect for not only apartments and houses, but also for a larger office, medical, and food service buildings. 20″ polypropylene sediment pre-filter extracts suspended materials such as sediment, rust, insects, and other particles down to 5 micron. 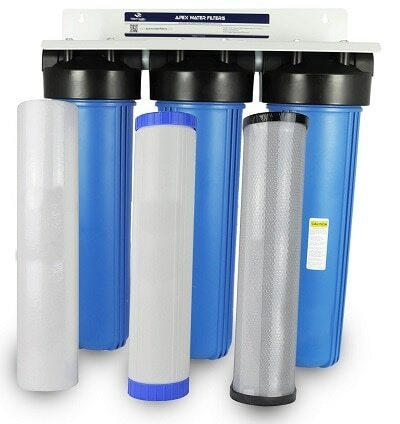 Multi-stage 20″ filter that consists of 1 micron filter pad, Activated Alumina, another 1-micron pad & Granular Activated Carbon (GAC) effectively removes fluoride, arsenic, chlorine, heavy metals and hundreds of contaminants from water. How Do Whole House Water Filters Work? The pre-filter removes large particles and impurities from the water. This stage prevents clogging later in the process. The second filter removes chlorine and chlorine-like substances from the water. This is why your water looks and smells good. The third stage is the activated charcoal filter. This catches the impurities not caught by the first two filters. This is why your water tastes good. The final stage catches anything that got past the first three filters. This is where UV kits clean the most impurities from the water. Heavy metals in tap water have been making a splash in the news lately. Heavy metals make up part of the Earth’s crust, and permeate the air we breathe and the water we drink. Think of lead, mercury, chromium, and arsenic to name a few coming out of your water tap. Up to 2100 known toxins are in our tap water. Drinking filtered water puts a filter in your kidneys, because they clean out toxins. Drinking filtered water helps them do their job at peak performance. The immune system is the first defense against viruses, pathogens, bacteria, and a host of other illness-causing factors. Clean water eliminates those factors. Your children will grow up healthy and happy with clean water to drink. Pregnant women run the risk of having babies born with birth defects such as spina bifida when they drink unfiltered tap water. Studies have shown that some nitrates in tap water are responsible for this. Mixing today’s powdered or canned formula with water is an option for new mothers unable to breastfeed their babies. It won’t do any good, though, if the water isn’t clean. They’ll spend more time at the doctor than playing with their babies. A healthy body with clean water to drink won’t be constipated. Nor will it have frequent headaches. The brain is 73 percent water, so drinking clean water will alleviate headaches. Studies have proven that dirty water equals migraine headaches. When you eat, what you drink with your meal washes the food down. The water you drink enters the bloodstream, giving your body the moisture it needs to function properly. Clean water does the job much better. Considering the pesticides and chemicals imposed on our produce, it stands to reason you’d wash it before cooking. Cooking in clean water doesn’t add waterborne contamination to your food. Your food will taste incredible, and you’ll be healthier for it. What Type Of Whole House Water Filter Do I Need? What Does The Filter Keep Out? If you don’t have heavy metals or chlorine in your tap water, what’s the use of buying a whole house water filter system to keep them out? If your water is already somewhat clean, then just buy your basic water filter system. It will keep out chlorine and other harmful things. Does The NSF Approve It? The National Sanitation Foundation certifies water filters. If the one you choose isn’t certified, keep in mind that smaller companies can’t always afford certifications. That doesn’t mean the filter isn’t of good quality. It’s less expensive, too. What Is The Life Of The Filter? Your water usage determines the life of the filter you choose. If you don’t mind changing it every year, then get that one. If you don’t want to be bothered with it, then get the ten year filter system. Pay for what you need, because you’ll be paying a plumber for the job. 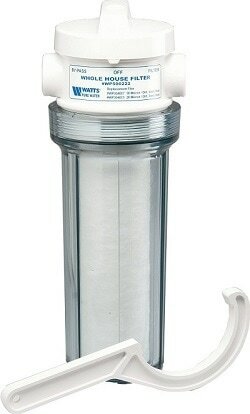 Not many homeowners know where to tap into the main water supply in order to install a whole house water filter system. If they know where it is, they might not have the proper tools for the job. The best way to get it done without problems is to hire a plumber who will know these things and have the right tools. Pre-filters and carbon filters should be replaced every six months. This depends on how much sediment and dirt they filter. For infrequent users, two to three years is adequate. Filters should be cleaned and disinfected at the same time the filters are replaced. All parts must be removed in order to clean and disinfect them, then reassembled. Water softeners contain salt that ionizes the water. When the water begins to smell bad, then you know the water softener needs replacement. If, however, homeowners don’t know how the water filtration system is attached at the water main, then it’s best to call a plumber to have the job done correctly. 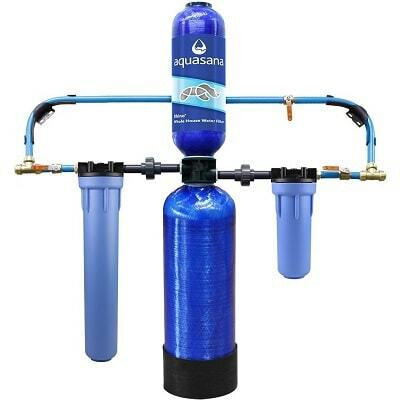 Our recommendation: The best whole house water filtration system would be the Aquasana. Not only does it exceed NSF standards by removing 97% of chlorine for up to 1,000,000 gallons of water, it also has a ten year warranty, a UV + Water Descaler optional upgrades, and tank life which makes the price a little more justified. The Aquasana comes with a pro-grade installation kit so you can install it yourself, but we recommend having a professional install it since it can be quite complicated. Clean water is vital to the human body in many ways. There are home testing kits or you can have it done professionally in order to know what types of contamination you’re up against. Whole house water filter systems aren’t more expensive than the health problems you’ll be paying to eradicate. We hope this review helps you to give your family the best water available.